With all due respect to this week’s guest, “James Marsden Wears Gray Pants And Black High-Top Sneakers” is more about Comedy Bang! Bang! nurturing the on-screen connection between Scott Aukerman and Kid Cudi than providing a platform for that sadly neglected slice of the Hollywood community, the handsome, affable, steadily employed leading man. Reggie Watts left some big foot grooves to fill, and Kid Cudi’s doing it ably. Following the self-conscious conflict and reconciliation of Cudi’s introduction, the show is building between them the same flexible relationship it manufactured, week by week, for Scott and Reggie: best friends, mortal enemies, whatever. This idea is made literal in the preview of Scott and Cudi’s upcoming “pretty gritty” feature film. After a supply run in the zombie-devastated wasteland, Scott (boasting a broad Southern accent) quizzes Cudi about the foraging team’s survival rate, and each time, Cudi replies with only a silent shake of his head. “Where’s Jane?” No. “What about Doug?” No. They’re dead, Scott. Everybody’s dead, Scott. Jane, Doug, Sheila, Tyrone, his wife Becca, Dan, Carlos, Larry, Marky, Ricky, Danny, Terry, Mikey, Davey, Timmy, Tommy, Joey, Robby, Johnny, Brian. They’re all dead, Scott. “Well, at least we’re still best friends, right?” No. Good news! Their friendship isn’t destroyed because they don’t get along. It’s destroyed because Cudi “got bit,” and zombies (“groaners,” as Scott dubs them) don’t have friends. They just have appetites… for brains. Scott scolds Cudi for gettin’ bit, and Cudi owns up with a playful shrug, a stream of blood pouring from his scampish smile, just before he lunges for his former friend. The title The Shaking Head flashes on-screen, followed by the promotional hashtag #shakeittilyoumakeit. The Shaking Head is a great example of Comedy Bang! Bang!’s glossy feature-film trailers, and it shows how well Kid Cudi fits into this absurdist universe, where even the darkest idea is often rooted in plain silliness. 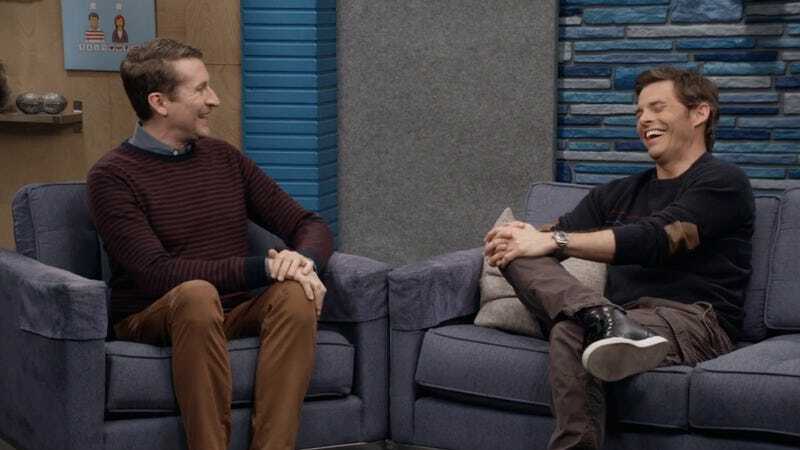 “Shake it”—ahem, “fake it ‘til you make it” is good advice for this new version of Comedy Bang! Bang! Scott and Reggie’s rapport developed over years, even before the show existed. While Kid Cudi establishes his own persona and wears his own foot grooves (wait, but he sits, so… chair grooves? Seat grooves? Maybe it’s best not to get too hung up on the grooves, enough with the grooves already), this episode explicitly plays with the relationship between the two. See above: best friends, mortal enemies, whatever. Magic is all about misdirection, and so is comedy. When the great wizard Stephendorff (Chris Parnell) enters our world to beseech Scott—a childhood magician so clumsy he severed his own fingers—for aid in his realm’s battle against That To Which One Must Not Refer, it’s just a matter of time before the revelation that Stephendorff sought him not for his prowess, but for his ineptitude, to entertain the army of The Realm with his bungling. It’s a greater bit of misdirection that dallying with Scott in the studio delays Stephendorff so long that his army languishes and succumbs to a danger even greater than boredom. Comedy Bang! Bang! is always about that uncertain territory between the familiar—stale television tropes, shopworn plots and premises, comfortably established relationships—and the changes the show can sketch on that old map. But more than usual, “James Marsden Wears Gray Pants And Black High-Top Sneakers” is packed with confusions of the real and the fake, starting with Scott’s naïve lumping together of stage magic and genuine wizardry. Even James Marsden’s physical appearance—so central to his persona that Scott introduces him with “Every man on earth is just a shittier looking version of him”—turns out to be a sham. Years ago, he struck an unholy pact with a painter whose likeness of him grows old as Marsden remains forever young. When Scott destroys the magical portrait (a hunched cartoon figure with a thought bubble above his head asking “Where are my dentures?”), Marsden returns to his natural form of an elderly man, and just as quickly regains his youth over the commercial break. Don’t ask how. Don’t ask a magician to reveal his secrets. It’s the refrain of this episode. Will you be my best friend? As James Marsden first settles on the couch, Scott gushes, “I like every single movie you’ve ever done and I’d like to be your best friend.” Marsden thinks that’s “a little much,” but Scott doesn’t demur or apologize. “I’ll just leave it there,” he says, hoping Marsden will relent and befriend him. Scott’s on-screen credit: See Kazakhstan. Paid for by the Tourism Board of Kazakhstan. Stephendorff’s tottering around the stage is a great piece of understated physical comedy, as is the contrast between Parnell’s doddering and Scott’s stagy preening. *Each kit includes 21 tricks.